One of my VERY FAVORITE people in the world is Jean Van’t Hul who writes the popular kids’ arts and crafts blog, The Artful Parent. Her blog is chock full of inspiration, and if you’re not already following her, you might want to go ahead and do that now! 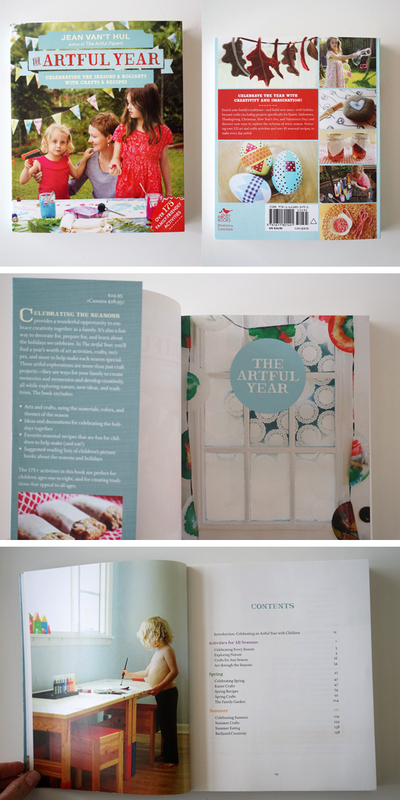 Today I’m thrilled to help Jean kick off the Blog Tour for her newest book, The Artful Year: Celebrating the Seasons and Holidays with Crafts and Recipes. Jean’s highly acclaimed first book, The Artful Parent has been a terrific resource to families who want to infuse their homes with art activities, and now, dear friends, she’s assembled yet another book, The Artful Year. It is so good! While her first book rocks, this book is sheer brilliance. Why is that? It delivers projects and recipes that are organized by SEASONS, to help us busy parents and caregivers come up with ideas that connect directly to what’s happening right now, be it spring, summer, autumn, or winter. My children are always tuned in to seasonal events, and I can already see how handy this book will be when it’s time to dye Easter eggs or when pumpkins start to show up in our market. Since we’re on the edge of Spring, why don’t we begin with the Spring chapter. Each section starts with an introduction to the season, followed by tons of art activity and recipe ideas that can be done with children. The Summer section includes 11 Summer Crafts, 15 Recipes, and 10 projects that encourage outdoor creativity. Shown below: Blueberry Hand Pies and Sand-casting. We’ve tried both of these and they are STELLAR projects. Come Autumn, you’ll undoubtedly be inspired by leaves, changing trees, pumpkins, Jack-o’-lanterns, spiders, and Thanksgiving. This section has your back! 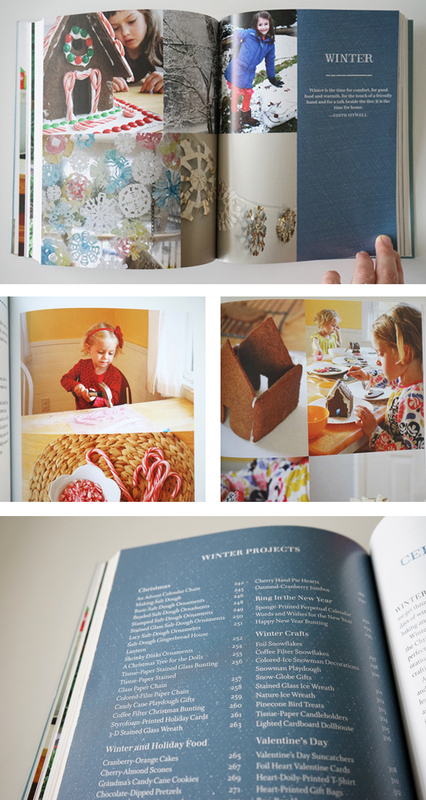 Since Winter is a time to hunker down and get cozy indoors, the Winter chapter of the book is enormous and delivers projects for Christmas, the New Year, general Winter crafts and recipes, and a huge section on Valentine’s Day. After pouring over this book, I had to test one of these projects out with my own children. While we are constantly making things, as you might imagine, there are so many projects in this book that I have yet to try. One that caught my eye is called Foil Heart Valentine Cards. We had a playdate and I asked the kids if they wanted to try drawing on a heated cookie sheet with crayons. They were skeptical at first and asked to see the book for inspiration. In hindsight, my question probably raised a red flag in their minds — why one earth would I invite them to draw on my cookie sheets?? The basic idea here is to heat the cookie sheet until it’s warm enough to melt crayons. Draw on the foil. Reheat the sheets if they cool too much, and then add your creations to cards. This was a super fun and original project, and I’m so glad the kids gave it a go. 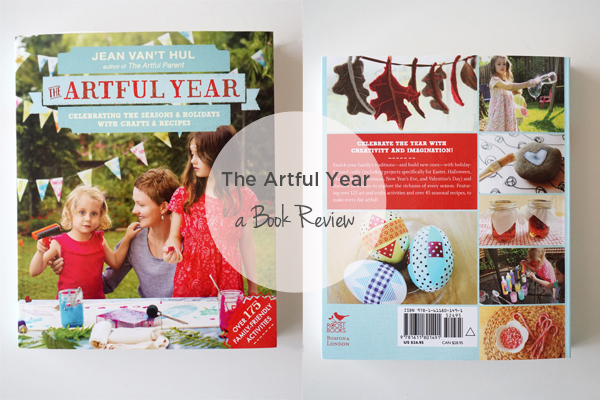 You can pick up your very own copy of The Artful Year, which happens to be the #1 New Release in Crafts for Children on Amazon, wherever books are sold. 26 MORE BLOGS will be sharing their sneak peeks into The Artful Year, and you won’t want to miss them. Some will share interviews with Jean and others may be giving away books. It’s a fun month ahead, and I hope you’ll check out The Artful Year in these other places, too! What is your favorite season and what do you hope to make from Jean’s book? There are 2 chances to win! Chance #1: Leave a comment in this post with your favorite season, and what you hope to make from Jean’s book — you can find the full table of contents here. Note: this giveaway is open to residents of the US, UK, Australia, and Canada. This giveaway will end at midnight EST on Sunday February 8, 2014. Winners will be chosen by random.org, and notified via the email attached to the comment. Thanks and good luck! Chance #2: Be sure to sign up for the TinkerLab newsletter (it’s filled with creative inspiration, 100% free and it comes out once a week) for yet another chance to win a copy of this book (details will be sent out later this week). The foil art activity looks awesome & not just for Valentines Day! My favourites are the shoulder seasons, spring and fall. In all honesty I’m excited about making everything in this book, but I’m particularly looking forward to the different Easter egg ideas and leaf sun catchers. I love her first book and use it all the time! My favorite season is early Spring. I’d love to check out the Easter and Spring projects! i would love the seasonal activities. I often struggle with winter months, especially on the weekends. Ideas on how to enjoy being inside is very welcome! My favorite season is autumn. My kids would love some new projects for play group! My personal favorite is fall. So many ideas caught my eye. I especially love the nature sun catchers. It would be a lovely use of our pressed petals and leaves. The garden crafts will be very popular with our daughters. Thanks for all the inspiration, Janet. I love fall & I’m looking forward to getting busy in the kitchen with my 2 year old. Jean’s recipes look delish & like there is a high success rate for even the littlest of chefs! I love fall! All the leaf related art ideas. And baking! I probably get most excited about Fall. We have nice warm weather where I live in the typical Fall months, but I love all the Autumnal decorations, picking apples, and change of weather when it does start to get cool. I’d love to see the ideas for Fall, but would like the chance to try some of the Spring projects you mention like the eggs and stickers. My favorite season by far is fall, so we will look forward to crafting leaf suncatchers. I love winter, but sometimes struggle to fill the days it’s too cold to be outside for very long! I am not really a New Year’s person so nay help with fun things to do would be great! I also love that there are baking and cooking activities included- this is something I turn to often to keep my kids engaged and entertained! Can’t wait to check it out! I love Fall the best I think and look forward to trying the tin foil art and baking with my preschool students. I love the nature tables too! My favourite season is autumn, I think my little boy would love making the blueberry hand pies. I can’t wait for Spring this year!! I’m tired of being cooped up in the house and I love exploring the changes spring brings along! I can’t wait to the nature observation and collection walk from the book! The blueberry hands pies are amazing!!! And her crust is simple, yet delicious! It’s the only one I use anymore. I agree with you 100%, Kelly! I’m a longtime fan of the artful parent and use it at home with my own kids, as well as in my classroom! I love her easy to set up and fun ideas. My favorite time of year? Hard to say, I love celebrating each change in the seasons! Summer is my favorite season but winter is when I struggle the most to be be motivated and inspired to be artful with my little ones. I love that she includes recipes and other things to go with each season. summer! Though, I think this book would be most helpful in the winter; I hate the cold dreary months, and need all the help I can get! Of the projects you listed, the valentines seem really awesome. I love projects like that. I love Summer especially now that my toddler is into running and climbing. We both would enjoy doing an activity from the summer backyard creativity section. Watching her explore also helps me with my own creativity. Spring is my favorite and I can’t wait to weave a bean pole teepee with my kiddos! I adore Fall and would love to try the melted crayon leaves. I love Jean’s projects! We are never lacking a fun project with her posts! Spring is our favorite season and we are looking forward to her Valentine activities. My favorite season is autumn, but I’m most excited about her winter section. Always need more inspiration to keep my little lady happy. I am expecting my third baby this month so i will be ready to celebrate spring with my three angels!! (4,2 & newborn) Can’t wait to try nature observation and to read the whole book. We love art!! My favourite season is autumn, when it starts to cool down. I’m very keen to try the melted crayon on foil, great idea. Halloween activities are our favorite but we live crafting year-round so this book would be perfect! I actually love all the seasons. Whatever one I’m in feels like my favorite at the time. I have my eye on the snowman playdough recipe because my last attempt at homemade playdough wasn’t successful but my son loves it! 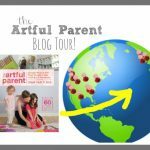 I have the Artful Parent book and LOVE it! I’m so excited there’s another book. I’m looking forward to the recipe inspiration for cooking with my kids. My favorite season is winter because I prefer cooler weather. I’d love to try the holiday recipes included in the book! Summer- I love hot sunny weather! I love being able to take the kids outside without spending 20 minutes to bundle and unbundle, only to have them complain that it is too cold and run back inside. I love the smell or the sun hitting the earth! love going to the pool! Yay, summer! Love summer…intrigued by the family garden. My toddler and I would love to make those blueberry hand pies! She is very into Blueberries for Sal these days :). Our favorite crafting season is winter! I find this activities by season idea so straightforward, natural and almost instinctive. With my little one being 1,5 it is a great way to introduce the concept of weather changing around us, even when it has been playing tricks on us recently, with not exactly a proper Spring-Summer-Autumn-Winter sequence in place. I guess then, it is also a way to letting him know how it used to be (‘Back in the days, when I was little…’;). For my older one, a 6-year old, this is a perfect way to touch on her already emerging environmental awareness, how we can successfully recycle things when playing, not necessarily buying new stuff. And how the year after year goes by, with us being part of the Solar system, when Space is her favourite theme. My favorite season is Autumn. 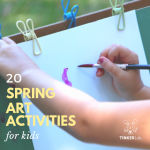 However, I’m really looking forward to her Spring and Summer projects – anything that encourages messy, outdoor fun. I love love love summer, and I would love love love to do the sand art activity with my daughter. Looks like a great book, full of fun! Summer! A wonderful season as the children at school LOVE warm weather outdoor play (in the UK!). Sandcasting will be a new experience for my pupils and I can’t wait to see their little faces (and messy hands!) when we try it! We have baking days twice a week and would love to make the blueberry hand pies. i love winter art! I would love to do the foil art . I’ve done it before but may have to find a way to modify it a bit for my students ( I work with special needs children & being around ovens & heated surfaces requires a lot of support ). Might try a hair dryer. I would like to have my kids paint a cardboard box house. I think they would really enjoy the process and to play with it at the end. Summer is my favorite time of year. Can’t wait to try sandcasting! Thank you for the fabulous photos! Our favorite season is summer and we would love to learn more about backyard crafts. Anything to help with being inside on the long cold dark days of winter is welcome. Anything to help get through the long hot days of summer until school starts is welcome also. For me all the seasons are great to make art with my little boys. I love all the ideas of the Artful Parent book and I hope I can get the new book pretty soon. Thanks for the pictures. My favourite season is summer. I’d like to try out some the nature based activities in the book, particularly the ideas for a nature table. I’m looking forward to spring this year after such a cold winter. I’d live to try the Easter crafts. My favorite season is summer, and I would like to do projects that involve nature, like sea shells and plants, which are so much more accessible to me in summer. I love the Artful Parents posts, and have made many things with her clear instructions. My favourite season is summer, but I also really like the winter holidays, and I’d love to make a Christmas tree for the dolls with my children. I’m sure they’d enjoy it! I love summer and would love to make some suncatchers with the beads! I love Fall for all its colors and the walks with my kids on which we love to collect fallen leaves, acorns and other treasures. Also my kids’ birthdays are in the Fall, too. Forgot to mention that we would love to do some Leave crafts from the book. They all look very interesting. I subscribed to TinkerLab newsletter. I love Spring and have always loved dying Easter eggs. This will be the first time we dye them with our daughter! Although I love summer my favourite crafting season is winter, fall being a close second. I would love to try melted pony bead suncatchers. My favorite season is summer. I can’t wait to try the melted crayons on a heated cookie sheet. Genius! Thanks for the giveaway. I love all the seasons. They each have something that I love. I’d most like to try the project you did with the melty crayons. That sounds so fun! I really love spring, and those melted bead suncatchers look really rad. I love spring! But I really love Valentines Day! Can’t wait to get more artsy with our Valentines. Hmm, I don’t see an index anywhere! Nevertheless, I love Christmas, but I do love the valentines crayon hearts :). Fall! Not too hot, not too cold, beautiful colours. A time of (hopefully) exciting change. I use Jean’s first book regularly for activities and inspiration and would love to win a copy of her second book. Thanks for the review and the opportunity. I’m all about integrating the seasons in everything we do at preschool and with my own children. The first book was laid out so beautifully and user friendly, I am sure this second one is as lovely or more so. Oh, I cannot possibly chose one season. They are all a gift in their own way. Okay, maybe spring……or autumn. I do love autumn. We are from new england and see the beauty in all four seasons throughout the year! This book is simply perfect!! I am so excited to see what my twin boys (age 7) will create. I plan to have them select one art craft for each season and frame the 4 pieces to create a collage to enjoy throughout the year. Summer is my all time favorite season and we’re really looking forward to making the beaded bubble wands. My favourite season is spring as my daughter wa born at spring Equinox, I would love to do some melted crayon egg decorating this year. My favorite season is probably fall but it’s so hard to choose! We would love to make some of the Easter egg decorations. I love Autumn …. but I would love to try the “Foil Snowflakes” .. I just love anything snowflakes. Thanks for the chance. And I subscribed to your newsletter. Spring is my favorite I can’t wait to try the melted crayons on a heated cookie sheet. Great idea! Thanks for the giveaway. I’m looking forward to so much in this book, but I’m especially excited for the food. I love cooking with my girls and would love more ideas! Christmas! My kids love making crafts as gifts. I am always looking for new ideas! I love winter, and I am eager to try the melted crayon drawings with my crew! I’m not sure I can honestly say winter is my favorite season, but it’s definitely the one we think about most in Vermont! When it’s too cold to romp outside, my toddler and I spend pretty much all of our time in the kitchen: the one-two-punch of new recipe and crafting ideas sounds pretty perfect. Definitely have anything melted-crayon related high on our list! This book looks amazing!! My favorite season is summer– enough with all this New England snow! 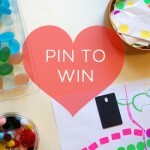 I love the heated cookie sheet and crayon activity– looks so fun! 🙂 I already subscribe to your newsletter. Thanks for the chance to win this fabulous new book of inspiration! My favorite season is Spring but I’m looking forward to the Winter projects because it’s more of a challenge to keep the kids entertained when we’re cooped up in the house. This book looks as fun and inspiring as her first book. I looove her first book and would love to have this one as well. It looks very beautiful and inspiring. I absolutely can’t wait to flip through this book and find it so inspiring as a nanny and future mom! 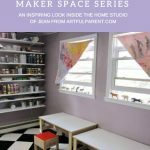 Fall & Winter – I love finding new ideas….as a mom of 3 and grandmom of 5 and opening an art school for kiddos this summer I love the experimentation will little ones. I love having a great library to share with them and inspire! This would be a great addition! OWLS, CRISP BREEZES, LEAVES FALLING and the SMELL OF PUMPKIN SPICE….nothing better than AUTUMN..looking forward to trying the leaf projects and baking some apple cheddar pies and making pumpkin WAFFLES! AWESOME looking book! My favourite season is Autumn. 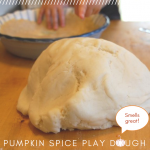 I love the Pumpkin pie play dough craft! So fun and easy for little ones. I loved her previous book! For me, it’s hands down Summer!! I love those long warm and hot days. Anything creative would be fun, but I love the sand art. My favorite season…fall but Spring holds so many educational opportunities. Fall. I can’t wait to try the garden projects though. I enjoy reading all of your blogs. Because I live in Hawaii we do not have any season changes. I love winter and will incorporate your winter ideas into my classroom. I am desperate for spring, but I think fall is my absolute favorite. I have loved the artful parents ideas I have seen online. Her tips and projects have breathed life into many long days. Now I see my kids suggesting we repeat projects that we did weeks prior! My favorite season is fall here but I would love to try the Easter ideas. Love that the book is divided into seasons! My favorite season is Spring, and can’t wait to do sun-catchers and learn different ways to dye eggs! My favorite season is Autumn. There are so many great projects in the book it’s hard to pick one. The melted crayon valentines look like a lot of fun though. I laughed at the fill in the jack o lantern faces. Wonderful work. Our favorite season is spring when everything is bursting forth full of life. We look forward to putting our nesting materials and such for the birds as Jean does with her family in her book. We also love to build our seasonal nature displays. Here’s to Spring! My favorite season is fall but the winter activities are the ones I look forward to trying with the kids since we spend lots of time indoors and need ideas to stay creative. My favorite season is winter. I am hoping the book can give me more ideas for easy to set up friends and family fun. Something fresh and inspiring. My favorite season, since I no longer live in Upstate NY, is winter. Those foil crayon creations might just be a project we tackle this week! Wow this book has lots of great craft activities that I can use in my preschool room, hopefully I’m one of the lucky winners of this great book otherwise I’ll just have to invest in my own copy. Good luck to everyone entering this completion. My favorite season is spring, any craft with spring flowers would be fun! I got so lost taking a peek inside the book that I almost forgot to come back here and comment! I love the summer and know a lot of those projects will be a big hit, especially the chalk paint and beaded bubble wand. The recipes sound good too! Winter is my favourite season and coming from Aust but living in Canada I’d love to try the ice decorations. Certainly a novelty. Summer is definitely my favorite season and I now look forward to making/weaving a beanpole teepee this summer! Thanks for spreading news about this wonderful looking book. What great activities to share with my grands. What a delightful book! Thanks for the chance to win. My favorite time of year with children is summer, because we can do all kinds of water-based activities outdoors, and then you just rinse everyone off. I love spring! I am looking forward to making the mirror paint art project (you use glitter glue to paint the paper and then you place another piece of paper on top to make a mirror image of the picture). How exciting. Summer is always been my favorite time of year..I’m thinking of trying the foil Valentine craft this week! thanks for the idea. I can’t wait to see more. Boy! This looks like an awesome set of crafts. I can’t wait to dig a bit deeper. My favorite season is fall. I love the Artful Parent posts as well Jean’s first book. I think we are going to try the melted crayon valentines this week. My favorite season is Fall. I would love to make the Spooky Fun Felt Garlands with the kids. We have an entry we love to hang homemade garlands from for all the different holidays and seasons. My favorite season is a tie between spring and fall, for different reasons. 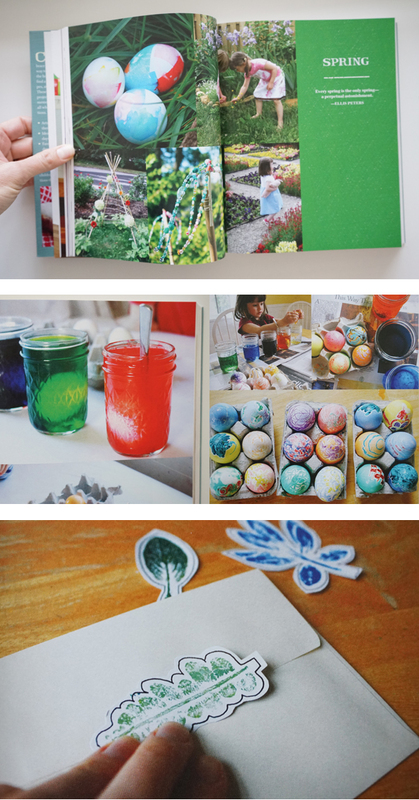 But the project that I look forward to in the artful parent book is the melted crayon easter eggs. I am always looking for new ways to decorate them and love drawing on them but it can crack the shell. Brilliant to use melted crayons! I love spring and fall, the coming and going. Crayon leaves look so bright and cheerful! As does the foil hearts! My favorite season is winter. I want to try the melted crayons on foil. What I love of your projects is that they are also fun for the bigger children in my family. They can all be brought to a higher level but are also beautiful as they are. Every age group is satisfied with the results, thank you for that! Ooh, I would love a copy! 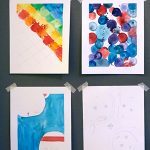 My daughter and I tried Valentine melting crayon pictures after reading this post and loved it. Autumn is my favourite season and i’m looking forward to trying the melted crayon leaves. Thanks! My Grandchildren are 3, 5, and 7, who love to do experiments and to make stuff. I love fall. I look forward to exploring all the seasons, with loads of creative ideas from this beautiful book! My favourite season is summer. I would love to try the weave a beanpole teepee project. My kids enjoy Easter crafts, eggs and bunny crafts. I’m looking forward to experimenting with Jean’s egg craft ideas. I love the fall! The autumn leaf project looks fun! I like summer more as a mom now because they enjoy being outside more and with friends. I would love to try the cookie sheet crayon activity you shared. So creative and it sounds simple! this is nice. 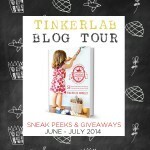 i love the inspiration.. my kids, myself and my husband are all doing the tinker lab together. its alot of fun, so thanks for sharing! I love Autumn! Hoping to make the melted crayon leaves….love the burst of color before all the white and starkness of winter months. As a Grandma I appreciate extra help with activities for my Gran-Boys. I receive Jean’s emails and have tried and shared several ideas. Looking forward to the book. I love Spring. There is so much energy. I’m a home schooling Mom for two 6 & 4 year olds, and a play group leader. What a wonderful resource this will be for us. I’ll show this to our librarians as well! 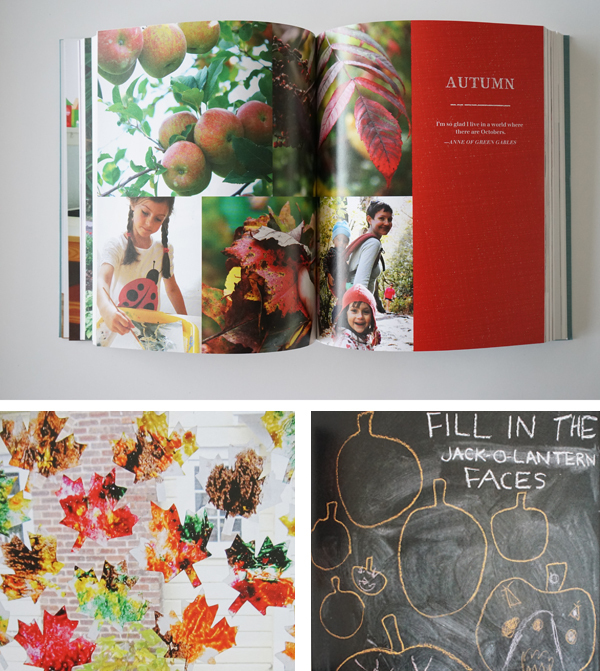 Many of the crafts look like fun, but the crayon leaves in Fall look like a great project. I have been following this resource, as well as several others, for what seems like years now, and I get the most amazing inspiration to share with my preschool classes. It is wonderful to have have new, beautiful, and child-led activities to do with the children after 26 years of teaching. Your blog and book help to inspire me and keep me excited about every day of teaching. Thank you! Melted crayon Valentine cards!! I have always loved melting crayons for art with kids. I will peruse this book for ideas for my 2nd graders but really think it will be perfect for my best friends grand-daughter who calls me mimi2 because I look like her grandma! I love fall! I want to try the crayon-on-foil project. That looks so cool!!! What a great idea! Having all this in one place saves much time. I love her ideas! I love summer!!! I also love The Artful Parent so this book would be great to own. I think my Monstro and I would have a lot if fun with the sand casting. I love spring. I’d really look forward to making 3d crafts/sculpture. We paint, draw, etc. all the time…time to expand our world! I have her first book and love it! The chapter on backyard creativity sounds fun since my son likes to be outside all the time! Thank you for sharing this book! 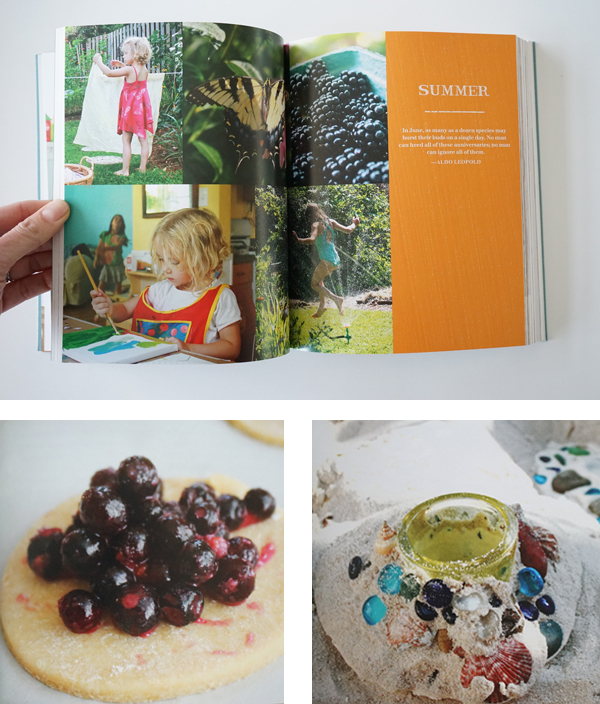 I found your blog out of pure coincidence and I just love the maker movement, I am trying to inspire parents and my students to get involved in art activities, but this book also includes recipes. My favorite activities are the gingerbread house and the foil activity! So much fun!!!! This book looks lovely! I would love the winter and spring activities and look forward to trying them in my classroom! Spring is definitely my favorite season, mud and all! I looked through the table of contents over at Amazon and saw a bluebird paper chain that looks just PERFECT for my girls, who are both bird lovers. Would love to try it out with them!! Thanks for the opportunity. Looks like a great book and resource. Can hardly wait for Spring. I want to try the melted crayon projects! Looks like fun! We are looking forward to her awesome Valentine activities. 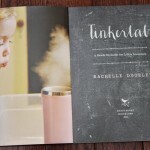 This book is the perfect inspiration for lots of preschool projects! I love the foil/crayon Valentines Day craft. My favorite season is summer. We live in Florida and we practically live at the beach with my grandbabies. It is so much less hectic. As a former homeschooling Mom I was spoiled with time with children. My grandbabies are not homeschooling so sometimes I feel cheated. They grow up too fast and I want all the time I can get. SUMMER! Summer and Winter are my favorites mainly because I just love playing outdoors and doing creative fun crafts with my kids. Fall is my favorite season because of all the colors. I am interested in new ways of doing Easter eggs as I usually have several kids over to join me in decorating eggs. So I’m excited to see what you do. I’m thrilled just find this blog! I would love to win a copy of this wonderful looking book! As an art teacher, I love these ideas to use and expand upon. Would love this book! I love summer (good thing, living in Miami!) and loved the sand cast candle holders. I would love to make them and some of the other activities with my son who has decided he wants to be a scientist. Or an artist. I have your first book and LOVE it. So excited for the second! I’ve been doing crafts with kids for a long time, and this book is great for new ideas and remembering old ideas that I haven’t thought of in a while-makes them new again. Glad to have a new resource. My favorite season is summer, most definitely! I love the warmth, and nothing beats staying up until super late, eating popsicles, jumping on the trampoline. I am intrigued by Jean’s chapter on Family Gardens. We grow a huge garden every year, and it’s a huge part of our home learning with our children. My favorite season is winter because I love hot cocoa and ice skating!! I can’t wait to make the snowman play dough snow globes with my kids!! It’s hard to pick a favorite season when they each have their own lovely and unique qualities. So I’m going to go with now, winter- and we will definitely try the melted crayon valentine cards – can’t wait! My favorite season is fall! Love the warmth on the day and the chill at night. I would love to try the melted brad sun catcher from the book. Our family’s favorite season is Fall and we will definitely be trying drawing with crayons on warmed foil to print some pumpkins, ghosties, and ghouls! This looks like an awesome resource book. Would love to win it!! Spring is definitely my favorite season. The leaf stickers and crayon Easter eggs look like fun projects for my boys! This non-artsy mom needs some help! Summer love…sunshine, sand and water with my seven grandchildren! I love the artful parent. Her blog has inspired me to create with my boys. My favorite season is Spring. I love that it starts to warm up and the colors start to change. Thanks for the chance to win. We did the Valentines Day melted crayon cards and my 4 year old daughter loved it!! They came out beautiful. Look forward to doing more of these crafts! I’m excited about the melted crayon leaves! I think my kids ages 3-15years will love that activity!